Full & Friendly Pediatric Vision Services! Children do not have the same visual needs as adults, and they need specialized eye care from an eye doctor who is knowledgeable about pediatric vision issues. In our Professional VisionCare offices in Westerville, Lewis Center, and Johnstown, OH, we will perform through pediatric eye exams to check for many common and uncommon vision conditions. Most of these typical kids’ eye problems are not detected by routine vision testing in school, and only a comprehensive eye exam will uncover the signs. When left undetected or untreated, many of these conditions can have serious effects on your child’s performance in school – when learning in the classroom, making friends, and playing sports. Don’t make the mistake of thinking that your child must be complaining about his or her eyes before it’s time to book an eye exam! Many children suffer from blurred vision or difficulty focusing, and they never complain. Instead, their brains simply adapt to how they see the world. Our eye doctors in Johnstown, Westerville, and Lewis Center are experts in diagnosing childhood eye conditions, such as lazy eye (amblyopia), nearsightedness (myopia), misaligned eyes (strabismus), and trouble with focusing (accommodation). Your child’s eye exam will be quick and pain-free. We will assess refraction to detect nearsightedness, farsightedness, and astigmatism, as well as screen all functional vision skills. Our optometrist will also inspect eye health by using high magnification to view retinal tissues and the optic nerve. If necessary, we may apply dilating eye drops to get a better view. We customize every pediatric eye exam to address the child’s individual needs, based on age and stage of development. Kids of all ages, from babies to teens, are welcome, and we use age-appropriate diagnostics and a gentle bedside manner to perform every eye exam for kids. If your child requires vision correction, we have a fantastic and fashionable optical for kids in Westerville, Lewis Center, and Johnstown, OH. Our staff will review the best eyeglasses options to support your child’s vision prescription and coordinate with his or her preferred style. Kids can be extremely picky about their glasses, and if their frames don’t match their chosen “look”, they won’t keep their eyewear on. We feature a wide selection of designs and colors for kids’ eyeglasses and sunglasses in our Ohio offices; please bring your child anytime to check it out. If prescription eyewear will not correct your child’s vision condition, such as myopia, then we will often recommend vision therapy as an effective treatment. Vision therapy consists of a series of custom-designed exercises to strengthen visual skills and reinforce the connection between the eyes and the brain. 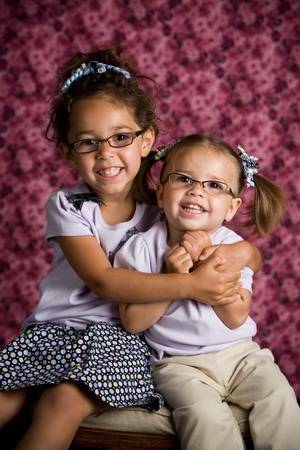 We offer a highly specialized team of professional vision therapists to work with your child. Nearsightedness, called myopia, has reached almost epidemic proportions around the world. Unfortunately, myopia is linked to more problems than just needing to wear prescription eyewear. Research has shown a strong association between high myopia and the development of sight-threatening eye disease later in life. That’s why many eye care professionals are currently recommending myopia control to reduce the progression of nearsightedness in kids. How is myopia control done? This is a hot topic among eye doctors. Our Westerville, Johnstown, and Lewis Center eye doctors may recommend the following types of myopia control: orthokeratology (ortho-k lenses), soft multifocal contact lenses, or atropine eye drops. Another method of myopia control that has demonstrated effectiveness is to encourage kids to spend more time playing outdoors! Sunlight and gazing off into the distance all the time (instead of staring at a digital screen) appears to slow down myopia progression. For more information, contact our eye doctors for a consultation to discuss your child’s candidacy for myopia control. We invite children of all ages to visit our eye care centers in Lewis Center, Johnstown, and Westerville, OH! Don’t risk compromising your child’s learning, development, and eye health - contact us to book a pediatric eye exam today. Do you have younger kids who don't yet need a full eye exam? Learn more about InfantSEE®.